So, it’s 4 p.m. in Las Vegas, and if you are like most visitors to Sin City, you are just coming out of your stupor from last night’s festivities, it’s too hot to troll the Strip and too early to hit the clubs; but you’re craving a little afternoon delight. … Not to worry, the great deal you got on Las Vegas Nathan Burton tickets from VEGAS (the app) offers you the ultimate daytime action! One of the city’s longest-running headliners, Nathan Burton has been performing on the famed Strip since 2001. The comic magician’s 90-minute show at The Saxe Theater in Miracle Mile Shops at Planet Hollywood features an entertaining mix of jaw-dropping illusions, beautiful showgirls, brilliant showmanship and laugh-out-loud comedy that is fun for all ages. Using a variety of props paired with witty tales from his childhood, Burton amuses and amazes the audience with his signature tricks that include making a real bowling ball appear from a pad of paper and making a full-grown man disappear into a toilet bowl. The show also features Las Vegas veteran comic entertainer Russ Merlin, who performed in V-The Ultimate Variety Show at the V Theater in the Miracle Mile Shops at Planet Hollywood. Burton, who was featured on the first season of NBC’s “America’s Got Talent,” has appeared in several television specials, including E! Entertainment’s “The Entertainer,” “The World’s Wildest Magic” and the “Ultimate Las Vegas Showgirl Challenge” where he spent seven nights locked inside a box with seven showgirls. 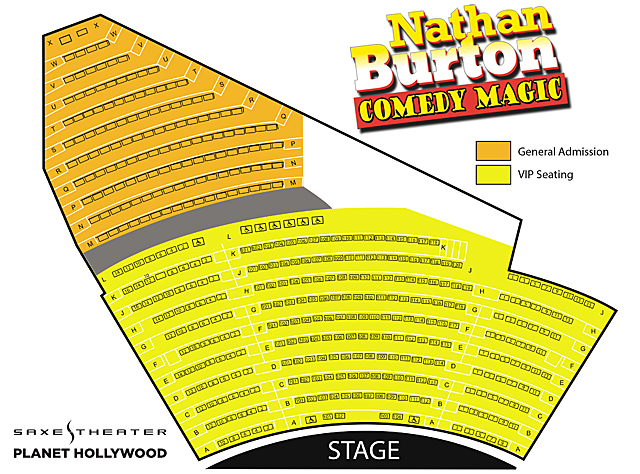 Get your low-priced Las Vegas Nathan Burton tickets from VEGAS (the App) today and see why Nathan Burton Comedy Magic is consistently voted the #1 afternoon magic show in the city. Seating is assigned as next best available at the time of purchase.